Torenia is a profuse blooming annual flower that starts flowering early in the season and keeps up the show through fall, with minimal deadheading. Most torenia varieties form a mound that eventually trails down the sides of pots. The plants are deer resistant and very attractive to hummingbirds. Torenia's bright and quirky upturned flowers give rise to many common names. If you've ever seen one looking at you, you will understand the name "Clown Flower". The name "Wishbone Flower" comes from the way the anthers arch and join at the tip when the flowers first open. Visiting bees break the wishbone while pollinating. And another common name, "Bluewings", came about because the original Torenia plants on the market, Torenia fournieri, had blue-purple tips on the petals. Plant your torenia in full sun to partial shade. Torenia appreciates some shade in extremely hot conditions. During very hot, humid summers, the plants will need to be kept well watered. Soil: Torenia is not particular about soil pH, but it does need a loamy soil that will drain readily but hold moisture long enough to be absorbed by the roots. Torenia does not transplant well, so seeds should be started in peat or paper pots. Don't cover the seeds with soil. Torenia is one of those plants that need light to germinate. Keep the soil moist and relatively warm (70 degrees F.) until the seeds germinate. After that, they can handle cooler temperatures. Pinching the growing tip when it reaches a couple of inches high will help to create a bushier plant. In frost-free climates, Torenia can be direct seeded outdoors, about 1 week before your last expected frost date. Transplanting: Torenia do not like being transplanted, so it's best to plant them in the peat or paper pots in which they were seeded until they are planted outdoors. To prevent disturbing the roots when you move them to the garden, you can plant them pot and all. Always harden off the plants gradually, before placing outside. Aside from keeping Torenia well watered and fed, there isn't much maintenance necessary. There's really no need to deadhead. They will keep on blooming unless it gets too hot for them to set buds. 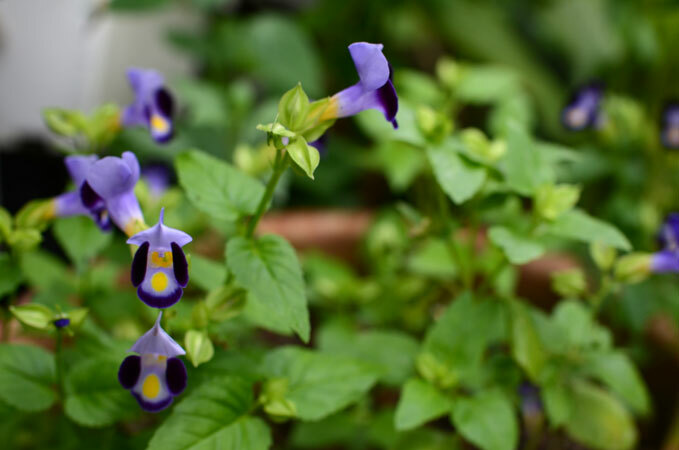 Feeding: Since Torenia is a prolific bloomer and usually planted in containers, you will want to give them a dose of flower food every two to three weeks. Foliage feeding, with a high potash food, seems to keep them happiest. Torenia is almost problem free. They can be susceptible to fungus diseases that will affect their leaves and stems. Keeping them watered and cool and providing good air circulation, so the leaves don't stay wet, should prevent most problems. The more popular Torenia plants get, the more varieties there are to choose from. Seedings are often sold while starting to bloom, so check out new varieties for your favorite colors. Here are some dependable standards to consider. Torenia fournieri - Has a shorter, upright habit with flowers in shades of lavender, rose, and white, usually with a pale throat and a bright yellow dot in the center of the lower petal. Summer Wave® series - Blue, violet, and amethyst Summer Wave Torenia from Proven Winners can handle the humidity better than other varieties. Torenia flava - The yellow wishbone flower has golden petal tips against a maroon throat. It trails nicely in baskets. Torenia does best in containers because it doesn't like to sit in dry soil. You will most often see it in hanging baskets, where it can fill out and shine on its own. It also works great as an accent against foliage plants, like sweet potato vines, or as an underplanting, or spiller, in a container with a larger plant, like an evergreen or fern. If planted in the border, use it along shady edges and be prepared to give it plenty of water when things heat up. Torenia can self-seed, but not to the point of nuisance. The flowers last quite a while when cut.